The Bureau of Labor Statistics (BLS) released the Employment Situation report for July. The top line numbers show total nonfarm payrolls increased by 163 thousand, with private payrolls adding 172 thousand and government subtracting 9 thousand. Revisions to the prior two months lowered employment by 6 thousand for those months. The unemployment rate ticked up a tenth to 8.3 percent, which the BLS characterized as essentially unchanged. 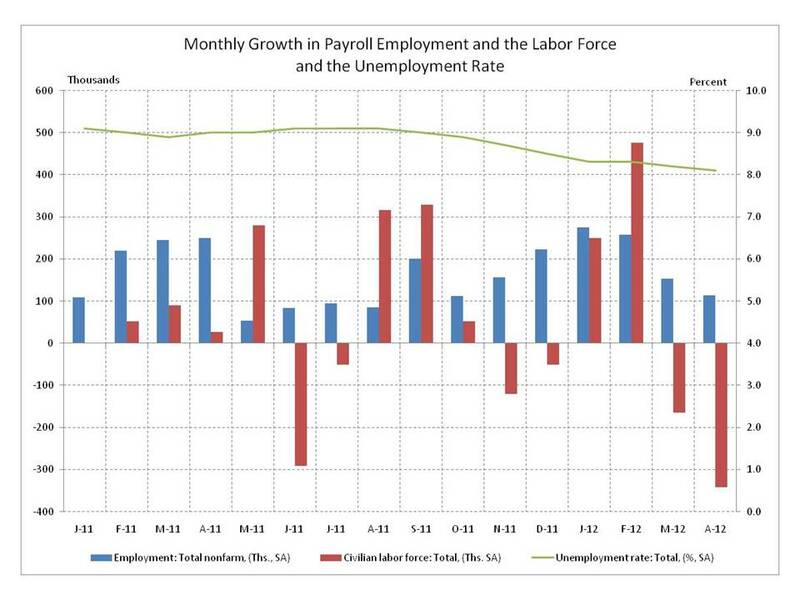 The report is mixed because while job growth in July was better, it’s still not good. 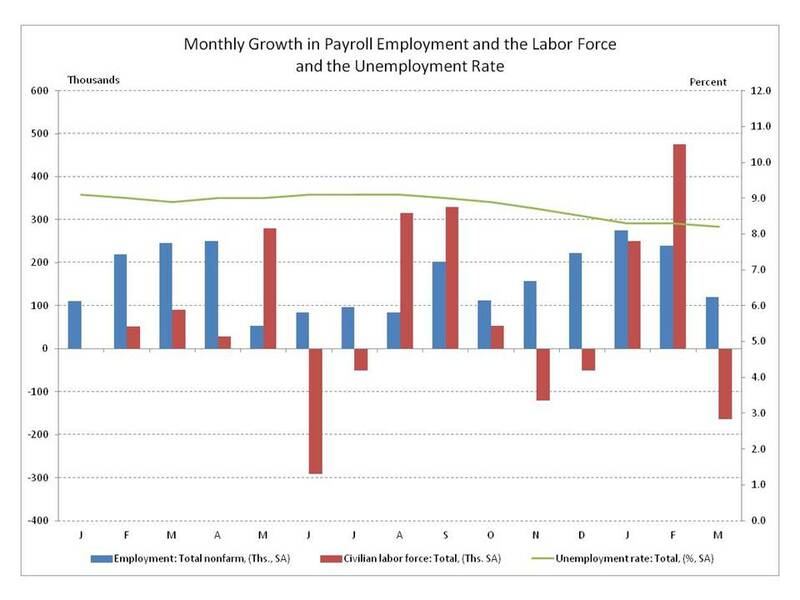 Growth in payrolls more than doubled from June but the pace remains too low and has been inconsistent. 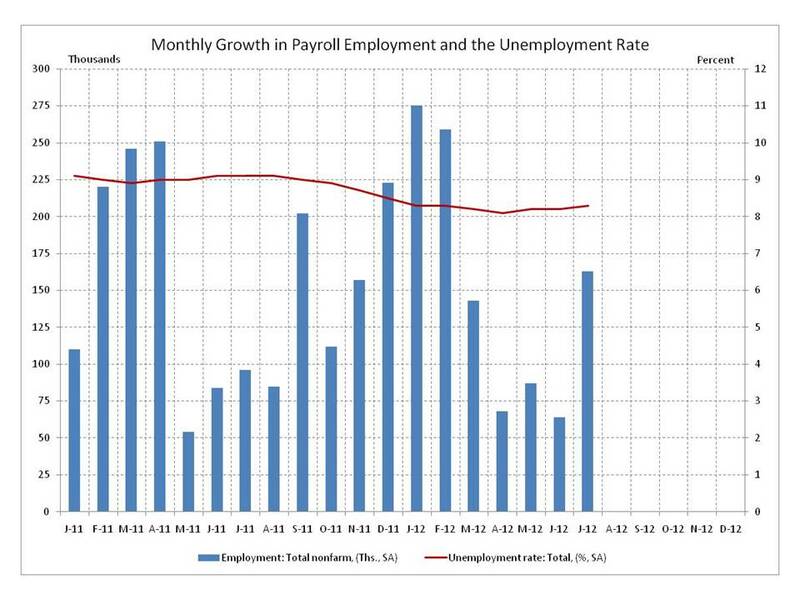 And while the unemployment rate increased, it’s more technical than substantive. It comes from a household survey which tracks people employed, unemployed and in the labor force. The uptick this month is based on a swing of 0.04 percentage points. Last month it rounded down, this month is rounded up. So the move is less than it appears. What’s more important is that the unemployment rate is stuck above 8 percent with no appreciable change in recent months. Whether job growth continues to improve or falls back again will be related to the pace of broader economic recovery, but some insight can be gained by examining how the different sectors of the economy were affected by and are recovering from the recession. Constructing indexes of the level of employment in different sectors of the economy since the recession began at the end of 2007 illuminates where labor market recovery is strongest and weakest. 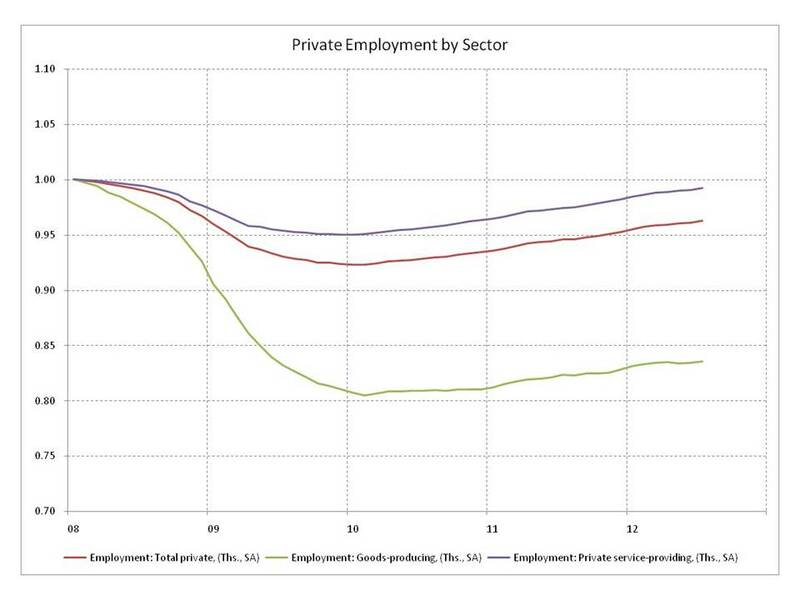 Disaggregating total nonfarm employment into the private and government sectors shows the private sector took a big hit early in the recession and has been recovering since early 2010. In contrast, employment in the government sector was relatively stable until mid-2010 but has declined steadily since then. Separating the government sector into component parts reveals that federal hiring for the decennial census is what kept total government employment steady until mid-2010. 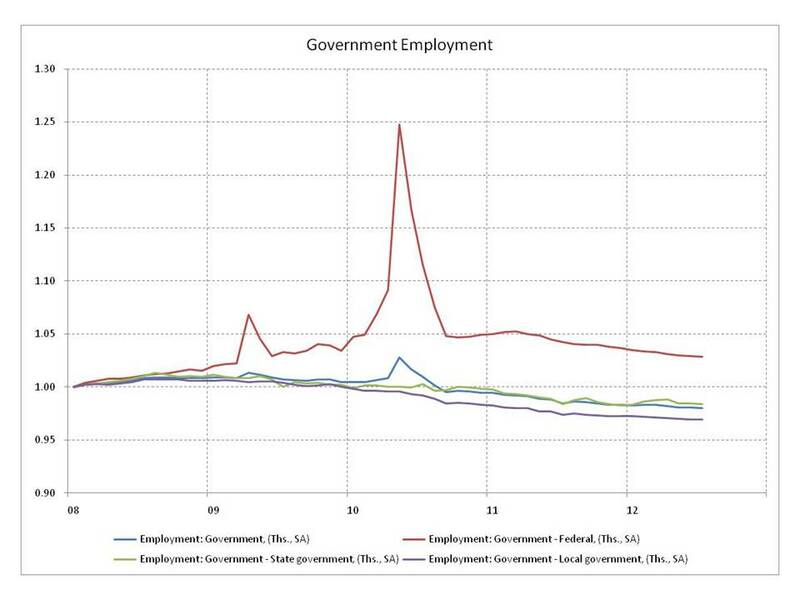 After the census, the unabated decline in state and local government employment dominates that sector. Separating the private sector into goods producing and services components shows employment in goods producing industries plunged by nearly 20 percent while employment in service industries declined by 5 percent. Disaggregating the goods producing sector into natural resource and mining industries, construction, and manufacturing shows large differences in conditions. Employment in natural resource and mining industries is currently 13 percent higher than the pre-recession peak. The construction sector remains depressed at 74 percent of previous employment levels. Employment in manufacturing has regained 4 percentage points of its initial 17 point decline. 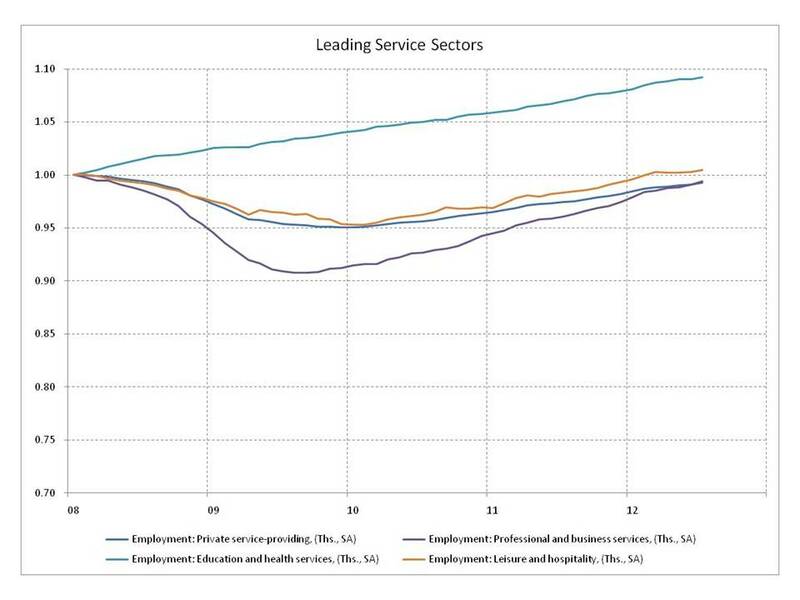 The services sector can be divided into above average and below average employment recoveries. The leading industries include education and health services which avoided any decline in employment and is currently 9 percent above its pre-recession peak, professional and business services which have recovered most of the initial 9 percent decline in employment, and leisure and hospitality services which have recovered from a 5 percent decline in employment. 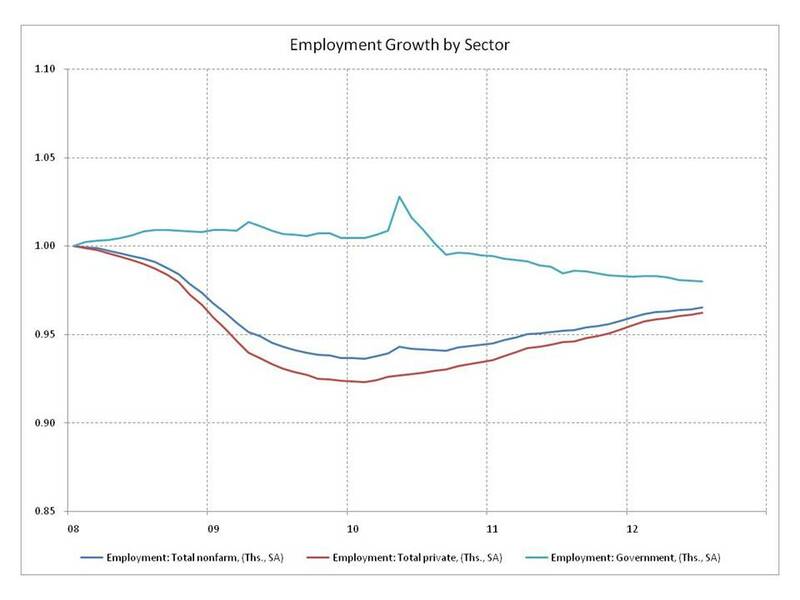 Employment growth in the remaining service industries has been below the sector average. Among these, employment in information services has only recently stopped declining. 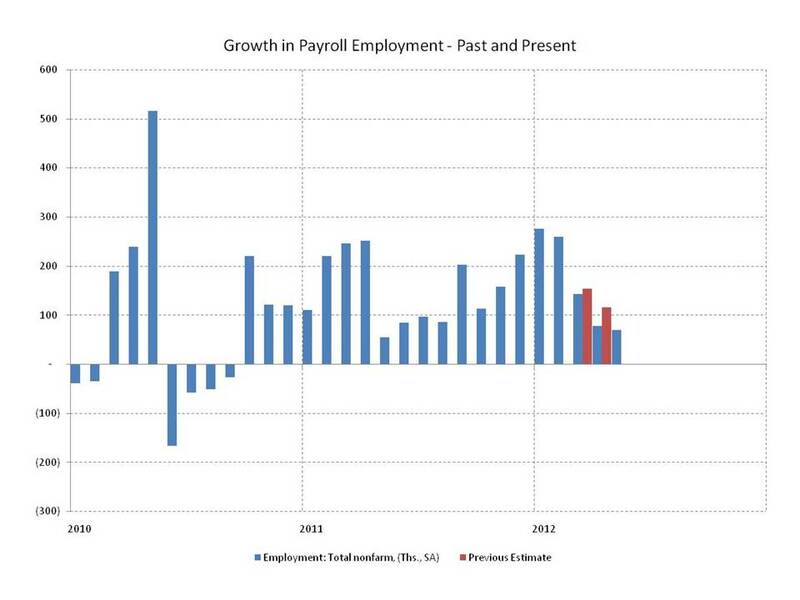 Payroll employment declined by 8.8 million in 2008 and 2009. Almost half of that, 4.2 million, was in the goods producing sector. 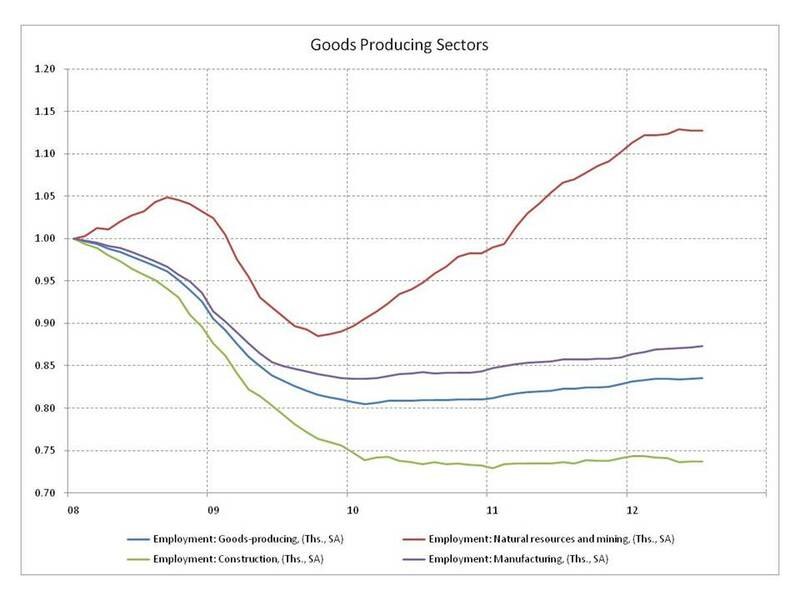 Employment in the goods producing sector has increased by only 624 thousand since then. Construction employment is stagnant. Manufacturing employment is recovering but has a long way to go, and the boom in natural resources and mining industries has peaked. These industries previously accounted for 16 percent of payroll employment (natural resources and mining industries accounted for 1 percent). 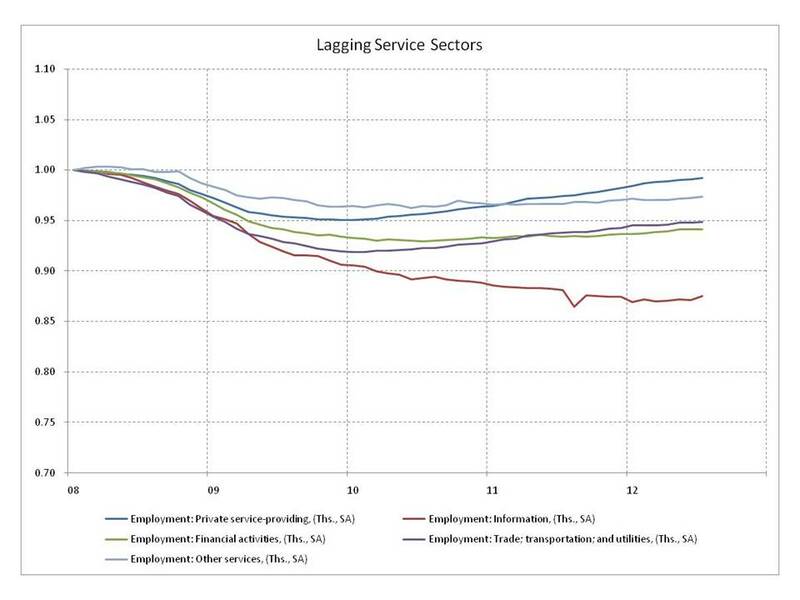 In the services sector, of the 4.6 million jobs lost, the three leading industries have added 3.1 million back. Employment in the education and health services continues to grow. But employment in the business and professional services industries and the leisure and hospitality industries has returned to roughly pre-recession levels and growth has slowed. The service sector industries that are lagging in employment growth previously accounted for roughly one third of payrolls. Employment in the government sector continues to decline and this sector represents another 16 percent of payroll employment. With a little more than half of the sectors of the economy experiencing such sluggish employment growth the outlook for the top line numbers is uncertain, and the July employment situation is mixed at best. The Bureau of Labor Statistics (BLS) released the Employment Situation report for May. Total nonfarm payrolls increased by 69 thousand in May with private payrolls adding 82 thousand and government taking away 13 thousand. The March and April estimates were revised downward by 49 thousand for those months, and the unemployment rate ticked up a tenth to 8.2 percent, based on a surge of 642 thousand in the labor force. The recent weakness has drawn comparisons to the last two years when early strength gave way to mid-year deterioration. In 2010 the initial threat of a Greek default rattled global markets and began the now long simmering Euro zone crisis. In 2011 the Arab spring oil price spike and Japanese tsunami and nuclear accident disrupted economic activity and trade. Now, with another slowdown in US economic growth, limited room for additional monetary stimulus and even lower prospects for fiscal stimulus, recessions and deepening turmoil in the Euro zone, and slowing global economic growth, maybe there is no smoking gun explanation for the weakening labor market, just a hail of bullets. Blaming the weather is just getting harder to do. Last month’s employment report included a preliminary estimate of total non-farm payroll growth of 120 thousand in March – disappointing. Today’s report includes a preliminary estimate of 115 thousand added jobs in April – more disappointing. The Bureau of Labor Statistics (BLS) released the Employment Situation report for April today. 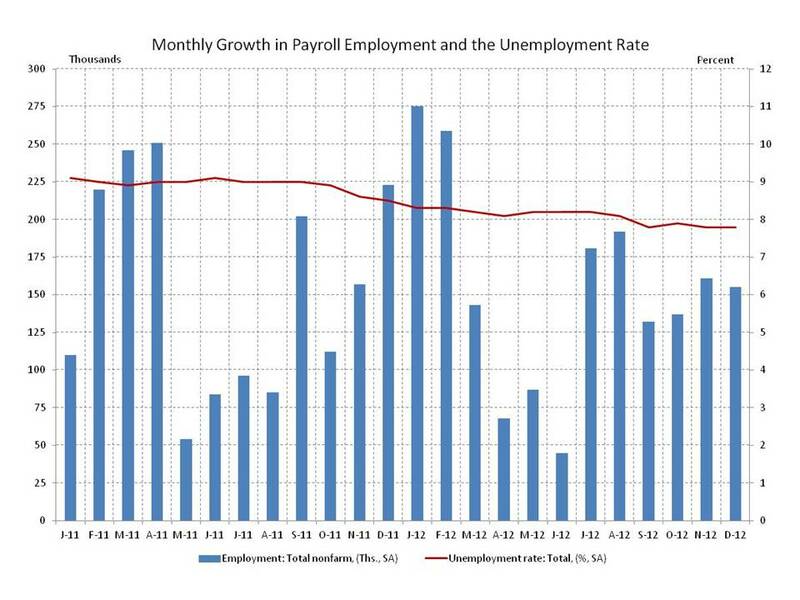 Payrolls increased by 115 thousand in April, the February and March estimates were revised upward adding 53 thousand for those months, and the unemployment rate ticked down a tenth to 8.1 percent, based on 342 thousand people leaving the labor force, rather than employment growth. The average workweek for most workers was unchanged, but up slightly in manufacturing. Not exactly encouraging. But it’s still possible that the slowdown in job growth is payback for a warm winter, making the distribution over the months misleading. And with the current average monthly gain hovering around 200 thousand, labor market conditions are not great, but not awful either. Growth in GDP appears to have slowed in the first quarter (probably, but we won’t know for certain until the revisions), but the expectation is that it will pick up again as the year progresses, and that should contribute to a strengthening in the labor market. It’s a little early to call the momentum lost. Overall, today’s report is disappointing, but it’s not the last word. The Bureau of Labor Statistics (BLS) released the Employment Situation report for March today. Payrolls increased by 120 thousand in March, an unexpected deceleration after strong gains in January and February that averaged 258 thousand. Some of the slowdown could be payback for a warm weather surge that boosted January and February. Even with the deceleration the first quarter average of 212 thousand is an improvement over the 164 thousand average in the fourth quarter, but a slightly shorter average workweek suggests a strong bounce back in April is not a given. The unemployment rate edged down to 8.2 from 8.3 percent, based on a decline in the labor force (164 thousand), rather than strong employment growth. Overall, today’s report is disappointing. A quick return to the strong growth in payrolls and the labor force in recent months would be welcome, but is not a foregone conclusion.